This is cross-posted with Miss Eagle's "Network". This report is extracted from several ABC News stories. There are some interesting things to note about these reports (of course). Denis Wilson offers to guide you through these murky waters. In a statement this afternoon, a spokesman for the owner of the unit, PTTEP Australasia, said the leak is continuing, however, the scale of the leak remains unknown. "PTTEP has notified authorities as part of its emergency response," spokesman Mike Groves said. "The Australian Marine Oil Spill Centre (AMOSC) is mobilising aircraft and dispersant to be in Darwin tonight and on-site in the Timor Sea tomorrow to begin aerial spraying of the spill. "The size of the spill is not known. "Approximately 40 barrels of oil were discharged from the wellhead in the initial incident - some of it into the sea. "Since then, condensate has been discharged at pressure dispersed in the gas stream. "It is not known how much condensate is in the gas." 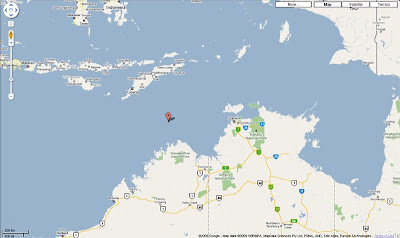 It is still not clear whether the spill will impact on the Ashmore Reef or the Kimberley coastline. The Australian Marine Oil Centre, based in Victoria, is flying truckloads of chemicals to the spill site to help break up the oil. Crude oil began spilling from the rig about 4:00am (AEST) yesterday. Australian Maritime Safety Authority spokeswoman Tracey Jiggins says a search and rescue plane with an environmental specialist on board is assessing the size of the spill and the environmental situation. "Obviously we're concerned about the oil spill and about any onshore oil, so that's why we're getting the dispersements ready and hopefully that will affect the situation." Mining company PTTEP Australasia said last night that there were no injuries among those evacuated. PTTEP says the spill is likely to be carried away from the Australian coast by south-westerly winds. Australian Marine Oil Spill Centre general manager Ivan Skibinski said aerial spraying will start at the site this morning. "Oil in the water disperses naturally. With a bit of wind and choppy water the oil breaks up into smaller globules and droplets," he said. "Chemical dispersant just aids that activity. You spray it on the oil and it helps pull the oil apart into smaller globules." Its OK for the oil to disperse by itself in the water. Ask the Whale Sharks (a "protected species" under the EPBC Act). Ask the Trepang which the Indonesian Macassan fishermen have been fishing for hundreds of years - the first recorded trade with Aboriginal peoples. If it gets carried north-west (as it will) it becomes Indonesia's problem. Australia's oil-spill response unit is based in Victoria - a very long way from the north-west shelf and the Timor Sea. We have to hire planes and equipment from Singapore. How long have we been drilling oil in the Timor Sea? Isn't it time we were better prepared for accidents like this? What does Peter Garrett think? That would be interesting to know, especially in view of the recent fiasco in China when Martin Ferguson signed up a 20 year deal for gas production off the North-west Shelf, without Garrett having yet approved the deal to go ahead off Barrow Island. Check out Martin's "What's New" page - it is blank! What a "goose" that man is! PTTEP is a company based in Thailand. If you investigate their chain of companies, the very first one Andaman Transportation has its office in the Cayman Islands. That's encouraging - a "Tax Haven". The establishment in 1991 of the Australian Marine Oil Spill Centre (AMOSC) in Geelong, Victoria, at a cost of ten million dollars represents a major commitment by the Australian oil industry to safeguard the Australian coastline in the event of a major oil spill. The Centre is financed by nine participating oil companies and other subcriber companies. These companies carry out the vast majority of the oil and gas production, offshore pipeline, terminal operations and tanker movements around the Australian coast. Aren't you glad that everything is under control? The ABC news at 2:00pm AEST has just carried a report that the Australian Maritime Safety Authority is now investigating this incident. That is a delay of more than 36 hours since the incident occurred. But don't worry they have lots of "plans" you can read on their website. My friend and Blogging colleague, David has posted this comment. I recently read a report where, due to humanity's search for oil in ever deeper waters, radar sounding equipment used to target the oil was causing the whales over a vast area to have to "yell" to be heard to each other. This is a particularly bad problem for the rare and endangered Blue Whale. Seems it is a solitary animal with infrequent meets for such things as breeding. These radar devices are also used in military applications and I find it no wonder that beachings happen amongst animals that need sonar for navigation. One wonders if it is to get away from all the noise down there.